This photo was taken on September 13, 2018 at 7:54 AM. 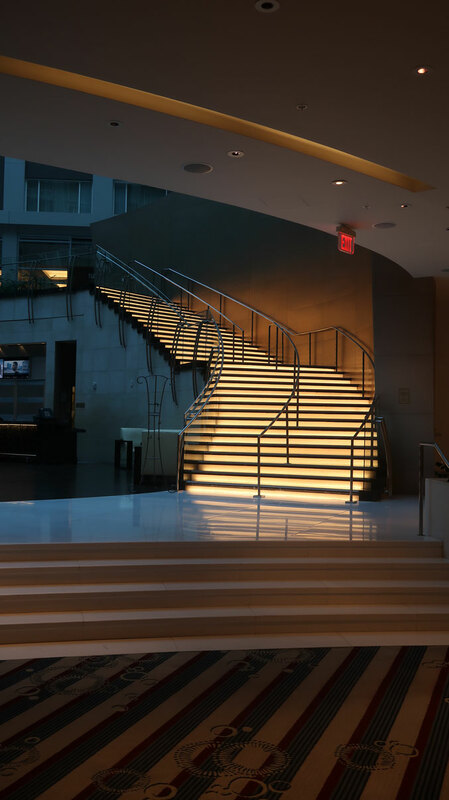 The location was in the lobby of a large and relatively new hotel in the City Center District in Washington DC. The "Take It!” came when I found myself looking at the stairs which I had seen before but never noticed the special lighting effect given to it with the light being concentrated underneath the steps. This was one of those times when I believe I was able to see them and be awe stricken due to there not being anyone walking on or near them - giving me no distraction - thus permitting me full focus in several ways. Perhaps I am taking this too far - but think these stairs could easily be used as part of a set for a movie - or some type of high fashion show. I someday hope to have a stair display using an idea which came to me about 4 months ago. When it is ready - I will put it on the site. WOW!!!! That is beautiful! It really does look like its straight out of a movie. I need lighted stairs in my house. Every woman on the planet imagines walking down those stairs in a pretty dress. The mood lighting really makes it stand out.